Feet are wonderful things. They allow us to walk around, jog, or run (if that’s your thing, of course). And those are just a few of the ways they enhance our daily life - their contributions to us are nearly endless. But what makes feet really awesome is that they are perfect place to wear shoes. You could wear the hippest of tennis shoes or the classiest of heels on your feet. And isn’t life all about being stylish? Sometimes we think a good pair of shoes is a cure for just about anything that ails you. But what if you are one of those people who doesn’t like to wear shoes? We have a few of those weirdos around the office. Even though it doesn’t make sense to us, we know there are people out there who like to keep their feet front and center. No gaudy shoes to cover them up - just pure, unadulterated feet. If you are one of those people (or maybe you are one of those people who likes to gross your friends out - either way, we won’t judge), then we have the perfect costume for you. 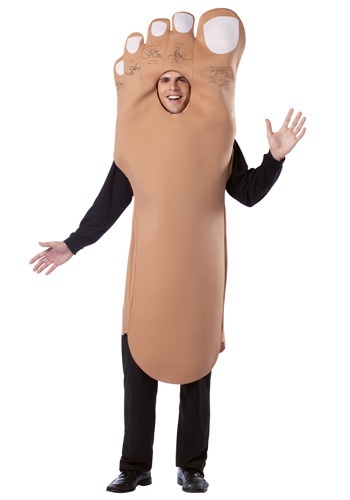 This foot costume for adults is the perfect funny and potentially gross costume for Halloween. This polyfoam tan foot costume will either get a lot of laughs or a lot of twisted faces - or a lot of both! This foot costume will transform you into the awesome appendage for Halloween in no time. Simply stuff with paper for a fuller foot look!